You've all heard my "horror movie sequel" spiel, probably enough times to make you sick. But horror movies and sequels are like peanut butter and jelly; they just go together naturally. Unfortunately, a great number of sequels don't advance the story, instead opting to recycle and rehash the previous movies in the series until it descends into self-parody. But the Ginger Snaps films are different, very different. The original, a modern day cult classic, is in my opinion one of the best werewolf films ever made. The sequel that followed, while not as good as its predecessor, was a respectable effort that advanced the previous film's story nicely. However, the producers of Ginger Snaps 3 decided not to follow up on the very intriguing ending of the second film, instead choosing to go in a completely different direction... a prequel? Our story takes place in the snowy wilderness of western Canada, circa 1815. On the verge of starvation and freezing to death, orphaned siblings Ginger (Katharine Isabelle) and Brigitte Fitzgerald (Emily Perkins) are searching for shelter when they come across a decimated Indian village. Nobody's around, save for one old woman (Edna Rain), who cryptically tells them, "kill the boy, or one sister kills the other." The woman gives them a pair of distinctive necklaces and they leave the village, but Brigitte stumbles into a bear trap soon thereafter. It isn't long before they're found and seemingly rescued by a mysterious Indian hunter (Nathaniel Arcand), who leads them to a nearly-empty trading fort exclusively populated by men. Under constant attack by wild beasts outside their walls and with their supplies dwindling, the men inside the camp are starting to go a wee bit stir crazy. Some have turned to drinking, others are insanely optimistic, and others follow the twisted view of God held by the misogynist/racist preacher Reverend Gilbert (Hugh Dillon). Despite the protests of the fort's residents, the sisters are welcomed into the camp by their leader, Wallace Rowlands (Tom McCamus). Unfortunately for the girls, Wallace has a dark secret. His dark secret soon comes back with a (most literal) bite, and as in the first movie, Ginger gets infected with lycanthropy. The gang inside the fort soon start getting all cabin fever-y and begin staging a mutiny, and the Fitzgeralds leave the fort to seek help from the hunter and the old Indian woman. What happens there leads to a fiery climax that sees Brigitte forced to make a decision between her love for Ginger, and her own fear of death. Seemingly taking inspiration from the Canadian Indian legends of the Wendigo, the film is quite different from its two predecessors. While the original Ginger Snaps is a clever allegory for the terrors of adolescence, and Ginger Snaps 2 is a werewolf-ized tale about drug addiction, Ginger Snaps Back is a gothic fairy tale. Its as if a Brothers Grimm story came to life. There are also some odd spots as well. Katharine Isabelle and Emily Perkins play the Fitzgerald sisters, as they do in the previous movies, yet they aren't the same. The Ginger and Brigitte seen here are familiar, yet new. It's a case of "The Fitzgeralds of Two Worlds." On the plus side, the revamped Fitzgeralds and the new setting make things fresh and interesting. The script, written by Christina Ray and Stephen Massicotte, is intriguing, yet certain parts hold it back. I did enjoy the new take on the sisters's "together forever" pact from the first movie, and the fact that the sisters wear the same necklaces they did in the first Ginger Snaps. Unfortunately, while the various modern colloquialisms and profanities are funny, they pull the viewer out of the well-crafted environment. Yeah, I really doubt they dropped F-bombs in 19th-century Canada. The script also suffers from having several very forgettable moments, but all in all, it makes for a very fun film, which is elevated by the fantastic acting. Just like in the previous movies, Isabelle and Perkins are the shining stars of Ginger Snaps Back, the two biggest highlights of the movie. The supporting cast is strong as well, but none of the characters are very likeable. The woman-hating priest is the biggest victim of this, but just about every character (with the exception of the two Indians) had qualities that just made me not like them. However, the movie benefits from wonderful direction and beautiful cinematography by director Grant Harvey and director of photography Michael Marshall. The costuming is also great (if all girls in 19th-century Canada are this cute, somebody point me in the direction of the Wayback Machine), and the gore effects by KNB EFX are outstanding. However, Alex Khaskin's score was almost non-existant. It's not a minimalist score... it just isn't there. That's a shame, because the first two movies had absolutely gorgeous scores that reveled in the melancholy nature of the series, yet this one is lacking that feel. While I thought the movie was entertaining, it just wasn't the same as the prior two. That's not to say it wasn't good, but it didn't strike the same chord with me as the first two movies in the series did. Perhaps my problem is that I was wanting more of the same when I should have been expecting something different, I don't know. But all in all, even though it wasn't what I anticipated, I can't really complain. 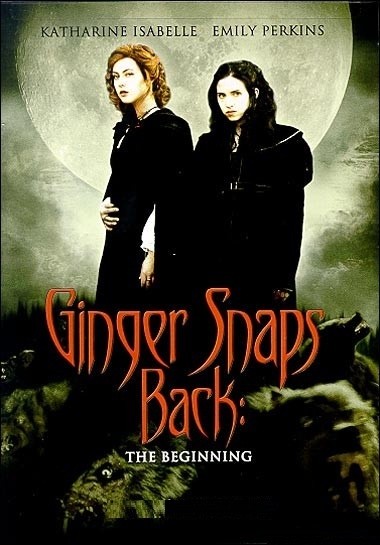 I'm a big fan of the Ginger Snaps saga, and the third part is no exception. Taking its flaws into consideration, I'll give Ginger Snaps Back three stars. It's a fun movie, but you might want to check out the original first.